There are 215,000 inhabitants in the Greater Salamanca area. Salamanca is found in the west of Spain, very close to the border with Portugal. It is the capital of the Salamanca province in the Castile and Leon region. Since the region is where the Spanish language originated from, Salamanca is very popular with Spanish learners, as people from here are said to speak the 'purest Spanish'. 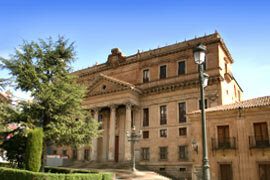 Salamanca enjoys all the advantages of a city, yet still has a friendly atmosphere. 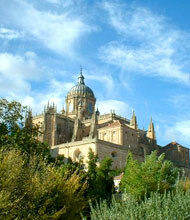 The University of Salamanca is second only to Oxford as the world's oldest university. The university is very popular with study-abroad students, as is the Pontifica University, also in the town centre. The city itself is listed as a UNESCO World Heritage Site. The city has beautiful architecture, and is often called the Golden City (La Dorada) given its unique glow emited by the city's gold sandstone buildings. Salamanca's baroque style main square, the Plaza Mayor, is heralded as one of Spain's most beautiful squares, and is used by the locals as a meeting spot, or somewhere to hang out. The Plaza Mayor is known as "Salamanca's living room"
Just a two hours journey by car, Madrid is 200 km (124 miles) to the southeast. Salamanca is also very close to Portugal, just an hour or so by train or car. The Sierra de Gredos and Sierra de Francia mountain ranges surround Salamanca. The region surrounding Salamanca is famous for its iconic jamón. For a fortnight in September, the city offers a programme of parades, concerts, bullfights, street markets and exhibitions, during the Ferias and Fiestas de San Mateo. 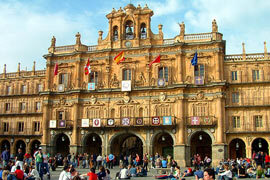 Salamanca has a vibrant nightlife due in part to its large number of students. Salamanca was the 2002 European Capital of Culture. The province of Salamanca is situated in the southwestern corner of the Castilla y León region, of which the city of Salamanca is the capital. Salamanca is just two hours away from Madrid, northwest of the capital. Salamanca is also one of Spain's many amazing UNESCO World Heritage sites. Salamanca has two beautiful cathedrals and many other religious buildings, which contribute to the city's stunning architecture. Large enough to enjoy all the benefits of a city (such as travel connections to other parts of Spain, a vibrant nightlife and boutique shopping), Salamanca also has the intimacy of a small town. You can walk anywhere within the city, and strolling about town is a great way to meet people. Since the language of Spanish originated from this region, Salamanca is very popular with students all over the world who want to study the Spanish language, as the accent used here is one of the easiest to understand. The Plaza Mayor here is one of Spain's most elegant squares, where a very common meeting point is "bajo del reloj" (under the clock). The region around Salamanca is diverse and beautiful; the nearby villages are renowned for their famous Spanish ham, and the mountains and lakes are great for short excursions to escape the city. Salamanca celebrates many of the same religious festivals as the rest of Spain, such as Semana Santa. One celebration unique to Salamanca is El Lunes de Aguas (Water Monday). On this day, the final Monday of Easter celebrations, the people of Salamanca gather on the banks of the Tormes River, or anywhere outdoors, to enjoy what is best described as a picnic with family and friends. The hornazo is the typical meal for this celebration; if you get the chance, make sure to try out this pastry filled with different meats. Another popular celebration is Ferias y Fiestas de Virgen de la Vega, with festivities of parades, open-air concerts, markets and exhibitions that are not to be missed, during two weeks in September.